Low Mileage, Air, Power Windows, Power Locks, Alloy Wheels, AM / FM / CD Player! Compare at $9656 - Our Price is just $9375! 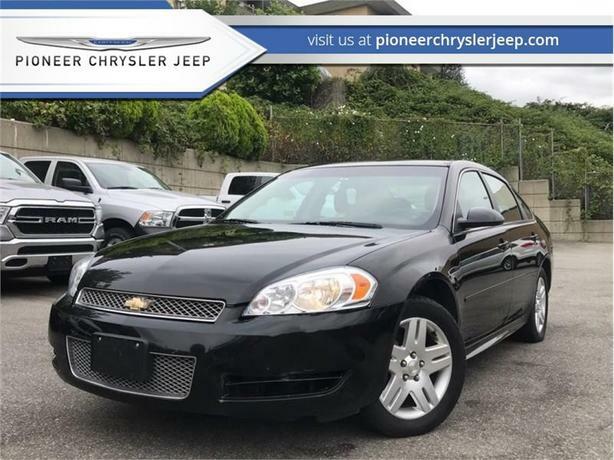 The 2012 Chevrolet Impala doesn't only offer great value, it also has an abundance of interior space, family-friendly features and top safety and reliability ratings. This 2012 Chevrolet Impala is for sale today in Mission. The Chevrolet Impala retains the classic American full-size attributes of a big, roomy cabin, an equally big trunk, and a soft, comfortable ride. For the 2012 Chevrolet Impala, you get a more powerful, safe and reliable sedan than much of the competition. Check out the Impala to see why Chevy has a reputation for reliability, quality, and value. This sedan has 103076 kms. It's black in colour. It has a 6 speed auto transmission and is powered by a 3.6L V6 Cylinder Engine. This vehicle has been upgraded with the following features: Air, Power Windows, Power Locks, Alloy Wheels, Am / Fm / Cd Player. Our Impala's trim level is 1LT. The Impala LT gives you some excellent features while still giving you a great value. Features include 17-inch aluminum wheels, remote start, heated, power mirrors, a deluxe driver information center, leather-wrapped steering wheel and shifter, Bluetooth phone connectivity, dual-zone air conditioning, OnStar, an AM/FM CD/MP3 player, and more. / Total cost of borrowing $2998 ). See dealer for details.